From instagrammable tasting menus to the satisfying quickness of a fast-food burger with fries, the food industry is a perennially busy one. It’s a fast-moving field, with lots of turnover and opportunities if you’re looking for one. 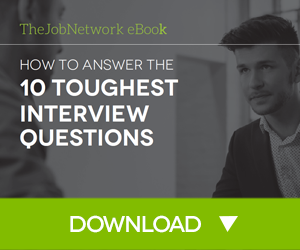 You need to be ready when those opportunities come up, or when you’re on the hunt for a new gig. The first step should always be getting your resume in order. 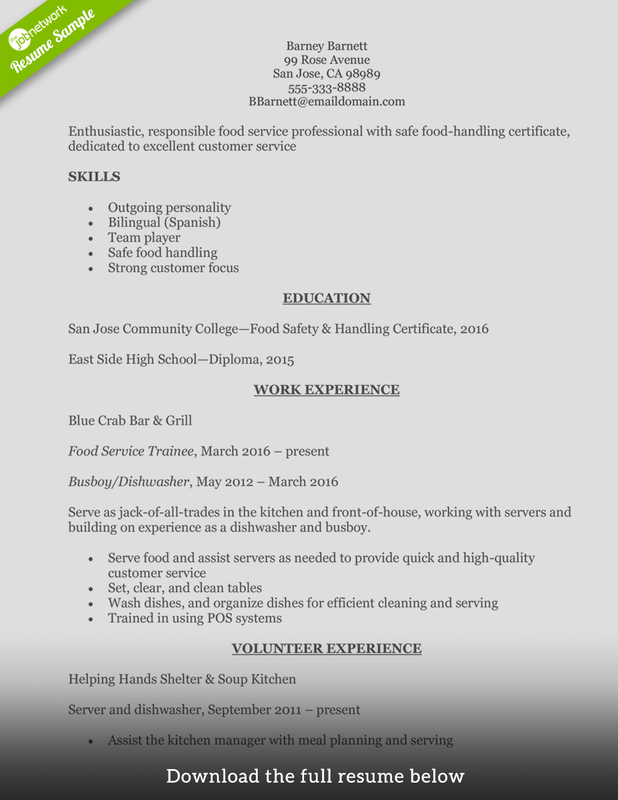 If yours could use a makeover, let’s look at some food service industry samples that can help guide you through your own resume revision process. First up is Barney, who’s looking to take his part-time jobs and volunteer experience and leverage them into his first full-time restaurant job. Serve as jack-of-all-trades in the kitchen and front-of-house, working with servers and building on experience as a dishwasher and busboy. Barney doesn’t have any full-time experience, so he wants to frame his skills as his biggest selling point. This means he’s using a slightly different format, putting skills up front. He also uses his objective statement as a headline of sorts, giving the reader the elevator pitch of his qualifications: service-oriented personality and certification in the field. This is his first chance to showcase what he brings to his next restaurant. For his experience, this section is short—but barney uses it to good advantage, showing that he has varied experience, working both in the kitchen and out on the serving floor. He also makes sure to include his volunteer experience, which is also kitchen-related. 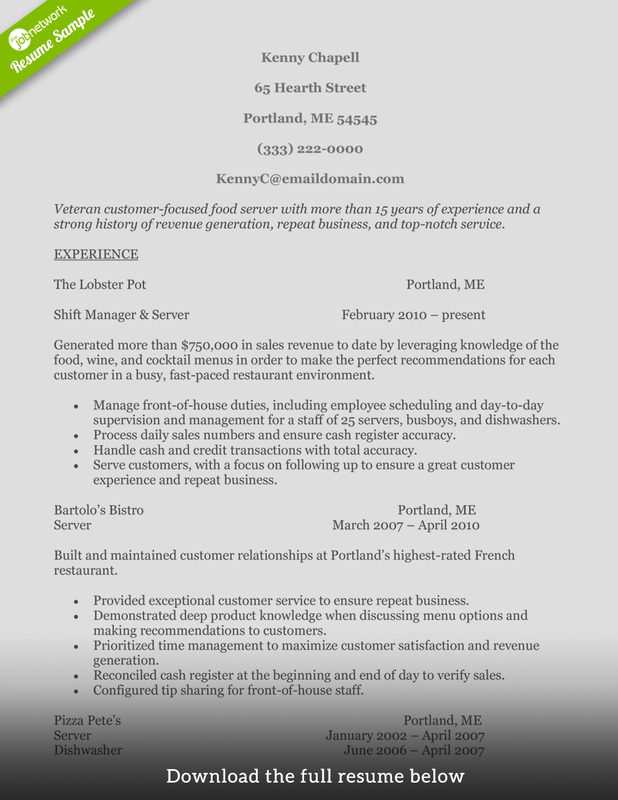 Next up is Kenny, who has been working in restaurants for more than 12 years, and wants to revise his resume to take advantage of opportunities to step up. Veteran customer-focused food server with more than 15 years of experience and a strong history of revenue generation, repeat business, and top-notch service. 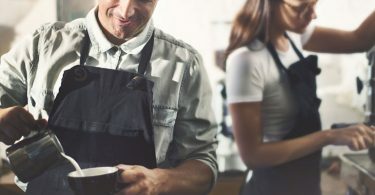 Generated more than $750,000 in sales revenue to date by leveraging knowledge of the food, wine, and cocktail menus in order to make the perfect recommendations for each customer in a busy, fast-paced restaurant environment. Manage front-of-house duties, including employee scheduling and day-to-day supervision and management for a staff of 25 servers, busboys, and dishwashers. Process daily sales numbers and ensure cash register accuracy. Handle cash and credit transactions with total accuracy. Serve customers, with a focus on following up to ensure a great customer experience and repeat business. Built and maintained customer relationships at portland’s highest-ratedFrench restaurant. Demonstrated deep product knowledge when discussing menu options and making recommendations to customers. Prioritized time management to maximize customer satisfaction and revenue generation. Reconciled cash register at the beginning and end of day to verify sales. Configured tip sharing for front-of-house staff. Created a welcoming environment for every customer in a fast-paced, family oriented franchise of a national pizza chain. Served food and drink orders quickly and accurately. Maintained a clean work area and other daily shift duties. Demonstrated strong teamwork and multitasking abilities. Promoted to server after less than a year spent as a dishwasher and food service trainee. Unlike Barney, Kenny has a lot of great restaurant serving experience, so the more traditional reverse-chronological format works well for him. Kenny is also very careful with his word choice, using attention-grabbing words like “veteran” and “revenue generation” in his objective statement to underline that experience to the reader. Word choice is so important on your resume—in a world where every job opening gets a lot of applicants, the words you choose can make the difference between an interview invite and a shuffle past—so choose wisely! Use words that emphasize how great you are, and speak to the skills and experience you want to highlight. Kenny also uses narrative to his advantage by giving a brief summary for each of his jobs to frame what he wants to emphasize in each one. Next up we have another restaurant veteran, Kelsey, who wants to make the jump to senior management, after years of serving and floor managing. 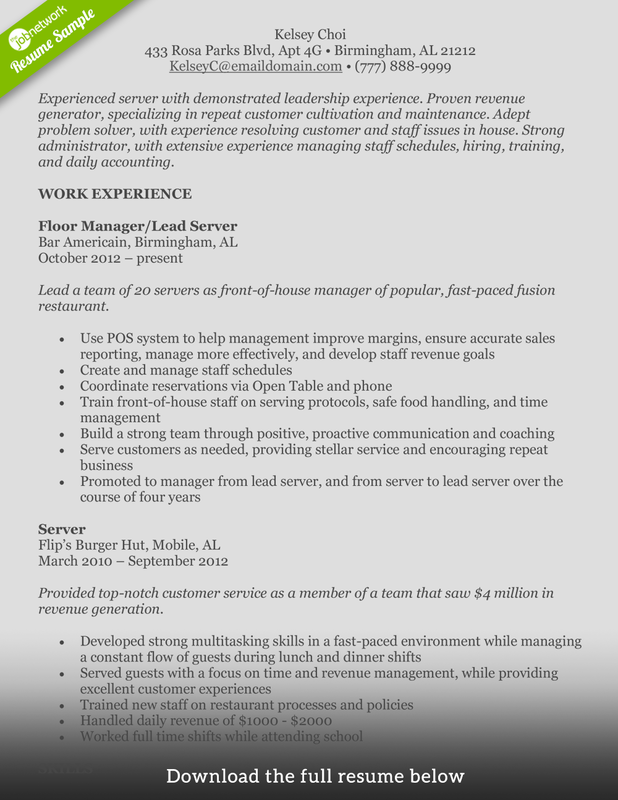 Experienced server with demonstrated leadership experience. Proven revenue generator, specializing in repeat customer cultivation and maintenance. adept problem solver, with experience resolving customer and staff issues in house. Strong administrator, with extensive experience managing staff schedules, hiring, training, and daily accounting. Lead a team of 20 servers as front-of-house manager of popular, fast-paced fusion restaurant. Provided top-notch customer service as a member of a team that saw $4 million in revenue generation. Kelsey has a lot of information she wants to include in this resume—that means she has a lot of editing to do, to make sure that a) she’s setting the narrative she wants to set; and b) she’s not overcrowding it. To do this, she needs to show her information in a very efficient way. Because she does have a lot of experience, and wants to show how multi-faceted she is a manager, she opts against the standard objective statement and instead uses a summary statement. This sets the tone of the rest of her resume, and gives her a guideline for the bullets she’ll use later, when describing her experience. Speaking of her experience, Kelsey sticks to her narrative by listing her most relevant jobs. She may have others, but these are the ones that showcase her development as a server and manager, which is what she wants to emphasize in order to level up in that area. This way, she has room to talk about her skills, without creating an overcrowded novel of a resume. For her skills, Kelsey doesn’t just list them—she provides brief examples or explanatory notes for each. Nothing too extensive, but enough to show the reader that she has concrete background for each. She should be prepared to discuss these in more depth (or add more examples) in an interview. Kelsey’s lowest priority (in her resume, not in life!) is her education. This is important, but this is a case where kelsey wants to emphasize her skills and experience in action. So while it’s key to note that she has degrees and certification, it’s not necessarily her headline. 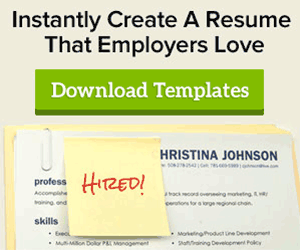 The key to crafting an effective resume is paying attention to what goes where. Templates and structure are great as a starting point, but you want your resume to make you shine—and that means customizing the doc to put your strongest professional qualities right under the nose of the resume reader.